Start your day off right with these delicious pancakes! Who knew that watermelon makes a great fruit topping? Vanilla Greek yogurt is a healthy addition and adds flavor and sweetness! In a large bowl, combine flour, brown sugar, baking powder and salt. Mix well. In another large bowl, combine mashed banana, vanilla Greek yogurt, milk, egg and oil. Mix well. Combine all ingredients and stir until mixed well. Spray a griddle or large non-stick pan with cooking spray (or lightly oil). Preheat over medium heat. Pour 1/4 cupfuls of batter at a time onto hot griddle or pan. When pancakes begin to bubble, after about 3 minutes, carefully flip over with spatula. Cook until browned on other side. Makes about 14 pancakes. To make the topping, combine watermelon, mint and honey in a medium bowl. Mix gently. 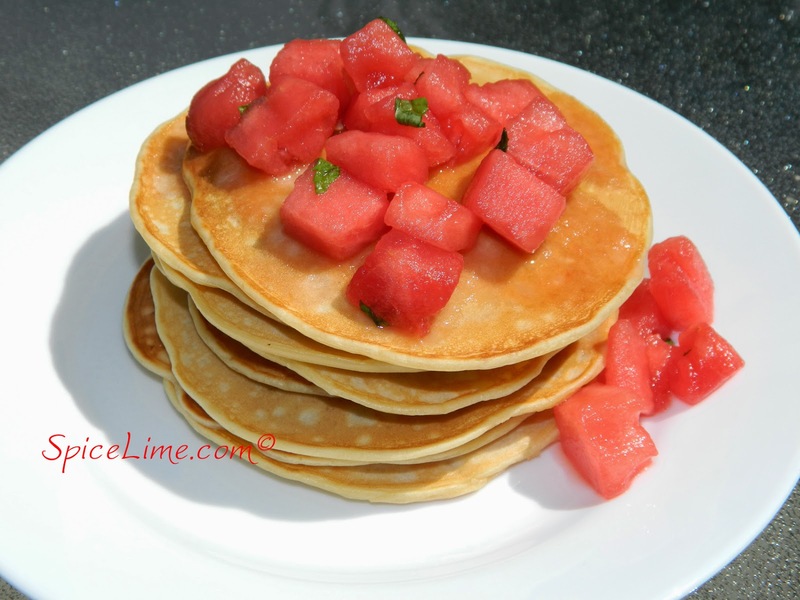 Serve warm pancakes topped with watermelon honey herb topping.